WebSpades Technologies Pvt Limited was using Google Apps for Business but it was free only for 10 users. In January 2013 we crossed the free limit and then it be $5 per month per user. As we only plan to be using Google Email, it was just too much for a new start-up.So we decided to move to Yahoo and signed up for Yahoo Small Business Email. WebSpades Technologies Pvt Limited was using Google Apps for Business but it was free only for 10 users. In January 2013 we crossed the free limit and then it be $5 per month per user. As we only plan to be using Google Email, it was just too much for a new start-up. So we decided to move to Yahoo and signed up for Yahoo Small Business Email. Yahoo pricing was really cool. It’s costs Rs 250 or $5 per month for 1000 users and so we decided to make payment for 5 years to keep the costs to a minimum. We assumed that we will have Yahoo web interface for business emails too and that will help us access emails from anywhere but realized that Yahoo Small Business Email does not have any web interface for using it. If you want to use Web Interface, you need to have a personal Yahoo account. So if you want to use shabbir at webspades.com then you need to be using shabbirbhimani at yahoo.com account and then access your business account. This would be killer because each employee would need to use a personal email in office to access the Yahoo mail interface of the company. 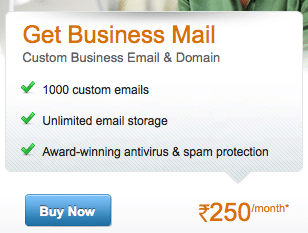 The only way to use Yahoo Business email is with Microsoft Outlook or other such Pop3/IMAP to applications. Finally we shifted to Live / Outlook, which offers 100 free emails using the outlook interface.